● With Andriod 5.1 system, we will have high speed feedback and smooth response. ● The processor in this chip is a RK3368 Cortex-A53 Octa-core with a maximum clock speed of up to 1.5GHz. Use the PowerVR G6110 as GPU. Apps have never run so smoothly. ● Support 2.4GHz / 5GHz dual band WiFi. ● HDMI 2.0 connector: You can go directly to let your TV and RKM MK68 TV Box are connected through a HDMI cable and set up your home cinema for the best 4K x 2K Full HD multimedia experience. ● Support 10 / 100 / 1000M LAN. 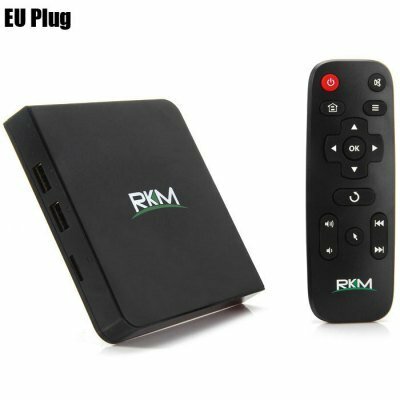 ● Rikomagic RKM MK68 TV Box integrated the latest XBMC media player software, with full functions of the multimedia entertainment. ● The box has a memory of 2GB DDR3, with 16GB nand flash, support mini SD card up to 32GB, easily enjoy many games and APKs.